Knowing exactly where a shipment is in transit has quickly become the expectation rather than exception. This month, many businesses (and entire industries) have been awakened to their supply chains’ dependence on consistent and orderly border clearance processes. It will be easier to measure your goals if they are clear goals that are attainable, relevant and time-based. “The future of shopping is not in decline, it is evolving." An ever-evolving list, these maritime companies are responsible for the bulk of delivery over sea. Watch for global banking leaders to continue to emerge from unlikely places and for the industry to become much more diversified. This will be a win-win for customers worldwide. No stranger to the competition found in a male-dominated industry, Drake continues supporting women’s roles in the supply chain and logistics industries. Women in Logistics: Wendy Buxton, President of LynnCo. Considerations in staying in-house or going with a 3PL are dizzying. One key area of concern is warehousing. ENERGETIC TEAM PLAYERS: More utility companies offer expertise and incentives to businesses moving or opening within their service areas. GIDDINGS: It’s looking to diversify beyond oil and gas. "This acquisition is an important milestone in the implementation of our solutions strategy and a confirmation of our leading position in airfreight." BLOCKCHAIN: The technology may allow banks to approach financing and risk management more flexibly. UNTAPPED RESOURCE: More companies that sell to companies that export should explore SBA export loan guarantees. FLYING HIGH: The U.S. Small Business Administration helped military parts company S3 International with export financing three times. THEY DON’T MAKE HATS LIKE THAT AT HOME The Latin American marketplace is complicated, but heeding these cautions could help add a feather to your exporting cap. TRUMP STYLE The oft-repeated suggestion that Trump properties rely on gaudy decor couldn’t be further from the truth, as witnessed by the stately elegance on display at The Old Post Office. TRADE WARS The Portuguese, owners of this cannon at a Gujarat, India, fort, dramatically changed the commercial system centered on the Indian Ocean when they arrived in the 1490s. RICHMOND, VIRGINIA: Local port now has the equipment to handle heavy lift. Virginia is the newest member of program to import fresh South American fruit to US East Coast ports. New forklift opens up the possibility for new heavy, or overweight cargo, business at Richmond Marine Terminal. Investments allows Richmond Marine Terminal to diversify and grow cargo mix. A grant from the federal government is helping The Port of Virginia diversify, grow and expedite the cargo moving across Richmond Marine Terminal (RMT) and on the thrice weekly Richmond Express service. This week the port put into service a portable, 40-plug central power unit that can be mounted on the Richmond Express barge and a specialized, heavy-lift forklift that will be used in the cargo operation at RMT. Both pieces of equipment were purchased using $446,747 in grant money from the federal government’s Marine Highway Projects grant program. The power unit costs $222,700 and the forklift is $373,234. The port is contributing $119,186 in matching funds. Reinhart said the expanded refrigerated cargo capability on the barge is part of the port’s larger strategic growth plan. 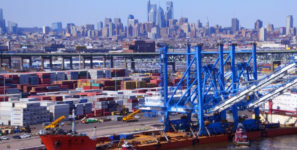 This asset combined with the port’s participation in the U.S. Department of Agriculture’s Southeast In-Transit Cold Treatment Pilot program will help to make the port a destination for cold cargo, Reinhart said. Virginia is the newest member of the program that is designed to import fresh fruit in refrigerated containers to US East Coast ports from South America. The new forklift, with is 52,000-lb. lift capacity, is part of the ongoing investment at RMT and opens up the possibility for new heavy, or overweight cargo, business. “An advantage to using RMT is that we can now provide services—using the forklift—such as unloading and loading of containers to the maximum allowable weight,” Reinhart said. “Those heavy containers are taken off of I-64 and safely moved west on the barge and when they reach Richmond, we now have the equipment to handle the heavy lift. Year-to-date cargo volumes moving across RMT continue to grow. Through November, the terminal has processed 21,491 containers, which is growth of nearly 25 percent when compared with the same period in 2016. The Marine Highway Projects program is administered by the U.S. Maritime Administration and focuses on expanding existing service on a designated Marine Highway Route that provides new modal choices to shippers of cargo, reduces transportation costs, provides public benefits including reduced air emissions, reduced road maintenance costs and improved safety and resiliency. ©2019 Global Trade. All rights reserved.